Treatment of ipsilateral femoral neck and femoral shaft fractures remains controversial. Generally treated with reduction and Femoral Neck Fracture Cannulated Screws 27235 of the femoral neck fracture followed by Femoral Shaft Retrograde Nail 27506. Other options include antegrade cepholomedullary nail, DHS, etc. Non-displaced femoral neck fractures should be treated with Femoral Neck Fracture Cannulated Screws 27235 before femoral shaft treatment to avoid displacement of the femoral neck facture during shaft fixation. Cephalomedullary device alone is associated with a higher malreduction rate of either the shaft or neck component and increased rates of nonunion or malunion. 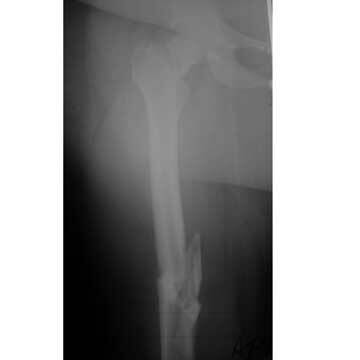 Wolinsky PR, Johnson KD: Ipsilateral femoral neck and shaft fractures. Clin Orthop 1995;318:81-90. Bedi A, Karunakar MA, Caron T, Sanders RW, Haidukewych GJ. Accuracy of reduction of ipsilateral femoral neck and shaft fractures--an analysis of various internal fixation strategies. J Orthop Trauma. 2009 Apr;23(4):249-53.